Dedicated to those who want to enjoy an espresso that tastes like it comes from a café` at home, in the office, in small communities and in B & B's Musica's professional features mean it can give anyone the opportunity to feel what it's like to be a good “barista” when making excellent espressos and creamy cappuccinos. Just some of it's characteristics are enough to show you how professional this machine really is. It has a visible pressure gauge for checking pressure in the boiler; water temperature is stabilised by an efficient heat exchanger inside the boiler tank (insulated to save energy), which also guarantees that there is always a great amount of steam available for foaming milk. 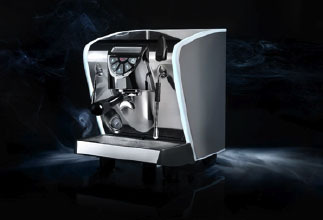 The pouring group is thermo compensated and has a pre-infusion system that allows all of the noble substances in the coffee to be extracted to the full. The hot water nozzle can be programmed to provide set doses so it is possible to prepare other types of hot beverages in just a few seconds. The professional filter holder has an ergonomic design, as does the practical cursor steam level. The elegant button pad with backlit soft-touch buttons (the brightness can be adjusted) is also an intuitive instrument panel with indicator lights (no water and heating element on). The volumetric dosing system can store up to three different dose settings. The hardwearing style of stainless steel, which features largely on the bodywork has an elegant and compact design reminiscent of a harp shape. The original lit edges (from tiny LEDs with low power inputs) on the “LUX” version give Musica a note of original refinement. A large water tank (3lt), complete with water stop valve and anti-scale cartridge, is located behind the large cup warmer shelf on the top. Musica also has a direct water connection version. 3/8” dedicated cold water line with shut-off valve and compression fitting (Direct Connect version only). Minimum incoming water flow rate of 35 GPH and maximum line pressure of 70 PSI / 5 BAR (Direct Connect version only - regulator not included).